It was incredibly hot in Cape Town and I was glad the bizarre and unfit-for-Africa 'Father Christmas' outfit (complete with white beard) remained behind. The ordeal would have surely led to an unfortunate collapse of a staff member, no doubt ... The children did not miss him one bit, as they started to sing 'Happy Birthday' to one of their own instead at the sight of the gifts! It was an tiresome day with ambivalent feelings of wishing to be elsewhere when we were told the 'stories' of each child, indiscreetly, openly. I politely tried to divert "Auntie Rosie's" show-and-tell to the direction of the incomplete rooms of the home instead - a fruitless attempt to increase the privacy and dignity for the children listening to the traumatic version of their lives, shared with newcomers. The reality of everyday struggles was amplified by a visit of a drunk uncle demanding that his twelve-year old niece return home soon. Auntie Rosie met him at the closed gate to chase him away firmly (handing him some cake in the process). Dinah* was taken aside with a few encouraging words... She needs to know 'he is NOT her father and she should NOT let him walk all over her". I could not help but see how she collected herself, her anxiety, slowly and shifted herself into a faint, shy smile - for the guests. (In that moment, I asked her about school and her progress and started to think I may have a possible sponsor in mind to assist her next year with school fees). 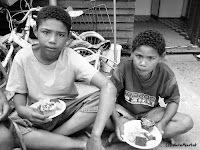 And the small ones sat on the cement floor fixated on the icing and chips, and assisting each other with plates. There was no fighting or squabbling for the two hours that we were there and it was crystal clear that Auntie Rosie and her assistants rule supreme. (The backyard is filled with dangerous building rubble on the hot white sand, and yet, ideal for creating a small playground). 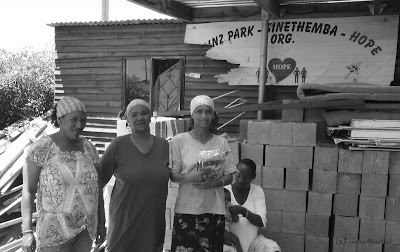 Poverty takes on an ugly face at Heinz Park Primary where 99% of the parent body are unemployed and dependent on social grants. Social evils that often accompany poverty – abuse (both physical and sexual) of learners, learners with AIDS, tuberculosis, drug dependency, hunger and a host of learning barriers – are highly prevalent at Heinz Park and educators struggle on a daily basis to instil (sic) better values in the lives of their learners and to help them see that a sound education holds the key to improving the quality of their lives. Our company ended up here this Christmas due to one of our corporate clients wanting to 'do something for Christmas'. (It really DOES boil down to the willingness of the leaders in a company to 'do something' and I was particularly glad for this call, as the staff members also participated. Corporate Social Investment is less about giving money, it is more about also making change happen in a world beyond the boardroom). I see many townships annually, but Auntie Rosie's tears about her son dying of HIV/Aids last year and the physical state of the two bedroom home for 17 children - with some sleeping in the kitchen - will haunt me a bit longer than others. The most important need here is (again) one of infrastructure, and in this case it is the resources to complete the home - a slab for the half-completed building. This is the same building (without roof!) that will serve as the local Christmas venue for the families - "because we have so many rooms here already", she adds with a big smile. They are "half-way there" with the building and build further each month as they can afford it. A lot of things are half-way there... here. There's much to do at Sinethemba but it is the desperation with this group of children that I have not seen this year, and that finally gets to me - keeping me up a few hours longer. Even the smiles of brothers Robbie* and Jeremy* did not seem to go further than the surface and a tearful gaze (for no apparent reason) of a nine-year old boy will linger in my mind. Nellie* fetches the puppy from the back to show us, and I wish she didn't. Three puppies died already. I want to take it home for more than one reason. 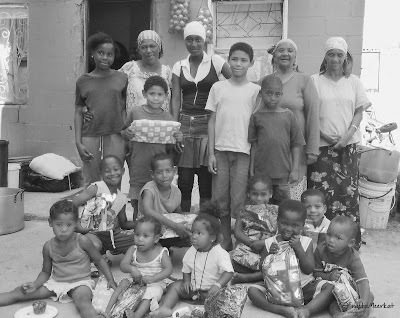 Today, I hope that 2009 will be a better year for Sinethemba (meaning Hope) and that there will truly be a better outcome for each of the children - one that decreases the sense of loss that is so vivid. "Oh, it has been eight years", says Auntie Rosie, "eight years since I have been to the sea with my kids". I am speechless for a moment: "We will have to make a plan", I say, "but I can't promise". (I repeat my motos in my head: Never, ever-ever promise. Never create expectations. There are too many broken promises. Just do what you can when you can with what you have). Ps: Let me share with you - I have never wanted to be 'a bleeding heart' or a fundraiser that appeal to others purely on the basis of dire poverty and need (with matching pictures of hungry children). I have always wanted to run with innovation, with sustainability, with indigenous solutions as the focus of grant-seeking actions. But there comes a time, like today, when your heart DOES start to bleed and you slip into that same desperation that you see around you. In this moment, you want to cry 'help' - toward others - in the same way as those that look toward you. The challenge would be to move beyond this moment - like the people I met today. For supporting this project in any way, please email us.